It’s Monday morning and science awaits. Science with plants, because plant science. Anyway, your job in Pollen is to get pollen (I see what you did there!) from very particular plants, the tools at your disposal being… well, you’ll see. 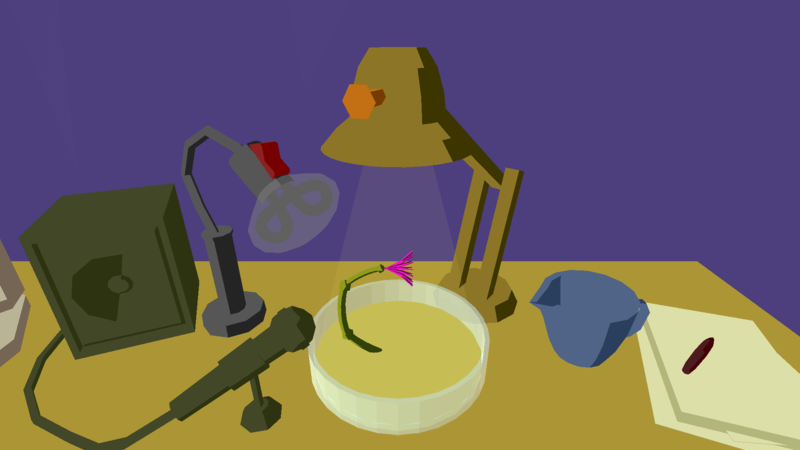 Oh and a microphone, so that you can record the singing of every last plant. Crazy? You bet, but a job is a job and I pay is at least decent. On your first day after the weekend, everything is kept simple, with but a desk lamp to aid in the growing of the plant. Increase or decrease the level of light until you find the right level, at which point a bit of a spurt should occur. After that, exiting the room will begin day two (or Tuesday, if you so prefer). This particular process isn’t overly complex, even as new tools – such as water – are introduced, and try as I might, I did not uncover a way to ruin everything in Pollen. Quite disappointing, really, as I do so enjoy making a mess in games like this. Then again, the terminal on which the task at hand is explained (in very little detail) did mention a mistake having occurred the day prior in my office. So… maybe? Either way, as you go through the week, each day introduces additional elements and / or brings back old ones, increasing the difficulty of each plant. Who’d have thought getting pollen was such a demanding task? It’s also one in which you don’t really spend much time on the job, as Monday through Friday passed by in less than ten minutes. If only I my salary was determined by the flower instead of the hour. Oh well. Pollen is available from itch.io, carrying a $1.00 price tag.